Specialist Auto Centre offers full servicing for all makes and models of car and 4×4. 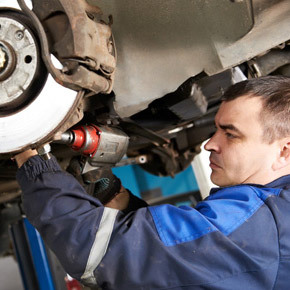 Servicing your vehicle regularly is key to keeping it running well and lasting for many years. We also specialise is performance car servicing including Ferrari, Lamborghini, Maserati and Aston Martin, to name a few. We are fully trained specialists with over 30 years experience. Almost all vehicles on the road today contain an ECU – Engine Control Unit, which continually monitors the performance of the vehicle. If your vehicle has an issue causing it to run badly, the first thing to check is usually the ECU. By using specialist diagnostic equipment, our team can read the engine fault codes and put right any issues with the vehicle. Brakes are arguably the most important part of any vehicle, so it’s incredibly important that you ensure they are always in perfect working order. Should you need new brake pads, brake discs or shoes, call in for a free quote. Specialist Auto Centre are also one of the few garages that can supply and fit carbon ceramic discs on performance vehicles. Specialist Auto Centre is now offering a Car Air Conditioning System Service helping to create and maintain a comfortable driving environment inside your vehicle. Most problems with Air Conditioning can be put right easily by a leak check of your system followed by a complete refill of your air conditioning refrigerant, this is sometimes referred to as a re-gas. Call in to Specialist Auto Centre today for a free suspension check. It is vitally important that your cars suspension is in perfect working order. Not only for the safety of you and your passengers, but also for the drivability and maintenance of your vehicle. Badly worn suspension can in turn effect tyre wear, ball joints and control arms. With resale values being an important aspect when buying a sports or prestige car, maintaining a cars bodywork and interior are as important as keeping up the servicing and maintenance of the engine. At Specialist Auto Centre we use only the best chemicals available and all insurances are covered, Public Liability, Employers & Motor Vehicle.